Those brave enough to corral goats are celebrated and hoisted up onto the immortal pedestal of legends. 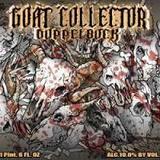 The title of “Goat Collector” is not simply given, it is earned. We suggest pairing this perfectly balanced, malt-driven doppelbock with a warm day and an adirondack chair. Think we’re crazy? We just might be… but until you’ve had a nice warm doppelbock in the sun… you haven’t had one.